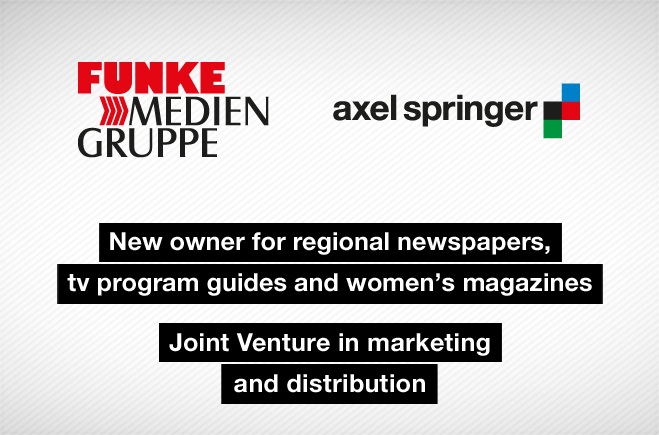 FUNKE MEDIENGRUPPE is to acquire Axel Springer AG’s regional newspapers as well as its TV program guides and women’s magazines. In the fiscal year 2012 Axel Springer’s regional newspapers, TV program guides and women’s magazines businesses made €94.8 million in EBITDA and €512.4 million in revenues. The purchase price is €920 million. The two companies have also agreed to establish joint ventures for the marketing and distribution of print and digital media. In both joint venture companies, Axel Springer will have the majority interest. The transaction is subject to approval under merger control and antitrust law, which is not expected to be obtained before the end of 2013.